+ So David started the Shred with me tonight. It kicked our collective bootays. I will admit that it was slightly easier this time around, although push-ups were still very hard for me to do. I think it has something to do with my double-jointed elbows? + Do you want to see the baby blanket I made for Lucy? I just love these prints from Fresh-Squeezed Fabrics! + Darcy asked for backyard pics. I feel pretty bad that she is in the Ice Age while we had lots of warm sunshine! I even wore flip-flops today! The temp was 77 shortly before the sun started setting. What's the weather like at your house? Wanna linky up with us? + I was so excited to see these cute little dolls from my friend Josephine's shop. If you are looking for a unique gift that is handmade with love, I encourage you to stop by her online store to see her creations. Josephine can make matching aprons and bonnets in sizes for little girls and mommy too! + What's going on at your house? Anything fun? Wow! Love that blanky. How absolutely precious. Awesome fabric! I didn't know you were so crafty. You go, Marsha! It's warm here, though, for our standards... about 30, which isn't horrible. It's a full 50 degrees warmer than it was around New Year's Eve. That was horrible. Cannot wait to see you in less than TWO WEEKS! Hmmm... what's going on at our house..... lazy, lazy and some more lazy. We live in Portland, OR so you can only guess what the weather is like today. But you already knew that. WTG with doing the Shred 2 days in a row. I wish I could have been a fly on the wall to see David do it. Too funny! I can't wait for flip flop weather, but I need to restock my flip flops. The ones I have are worn to the ground... literally. Those dolls are fabulous! I'm thinking I need to get Em one and maybe Lulu too. I know if you haven't already, you're going to get Lulu one so make sure you let me know what you get so we don't get the same one. :P Ok. That's all for now. I love you! Totally jealous that you're going to see Harry in a couple of weeks. *sigh*. I'll talk to you later. beautiful quilt! 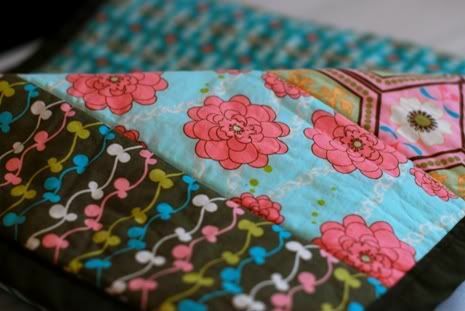 I love handmade quilts and blankets for babies, such a wonderful thing for them to have for the rest of their lives. I'm impressed he's doing The Shred with you. Keep us updated on how it goes. maybe i'll get inspired to start myself. not much is going on today although the sun is out so that makes it a great day! oh, one more thing. i just started reading amy's blog~love it! LuLu will surely love that quilt. What a precious aunt you are! It's gorgeous. What are we doing? Well, we're just playing and "doing" school. Hope you have a great weekend. Watch out for those pushups! I LOVE the blanket! 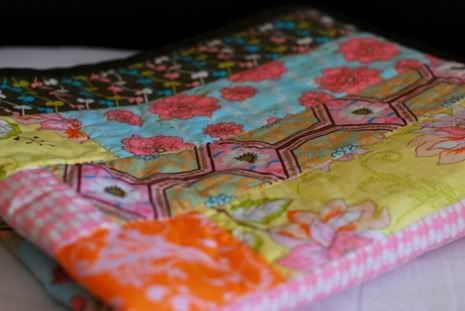 Are you "strip quilting?" If so, have you shared this method somewhere? 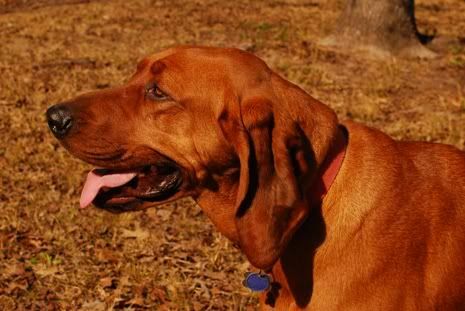 Oh, and my 8YO son likes the picture of your dog with his (her) tongue hanging out! Your work is beautiful! 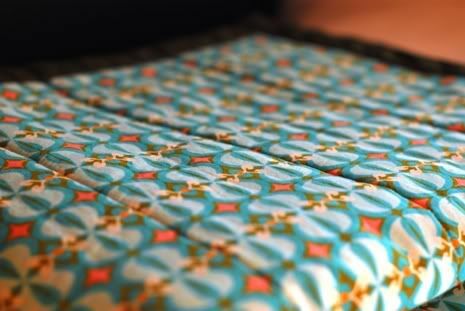 That quilt will not only be eye candy it will be so special coming from your hands and heart. Love it! That is the cutest baby blanket EVER. Seriously, amazing. And how cool it was handmade by her Aunt with love? THE BEST. Super cute blankie! What a wonderful gift. I'm absolutely in love with that baby blanket. 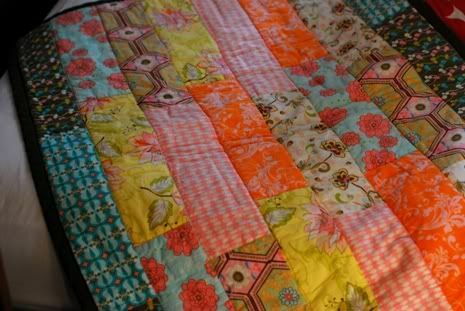 What a beautiful quilt and a treasure for your niece! We got it ... we got it !!!!!!! Yay and THANK YOU ..... come on over I did a post on it! beautiful baby blanket, I love the fabric. I love that little doll, thanks for the link. oh my. I LOVE that quilt! you are awesome! will you make me one like that when we have another baby?! heheh. Don't worry, not a lot of possibility there, but you never EVER know for sure! You (super-wonder-woman-blogger-famous-YOU) mentioned ME on your blog! hah! I feel very honored and your sweet comment makes me smile... and I can do even better at loving Micah! :) I was inspired by my SIL, she is so sweet to my BIL! That baby blanket is so beautiful! I am loving those fabrics!!! It is 10 degrees here in Northeast Pennsylvania(with the wind chill, it feels like 0). 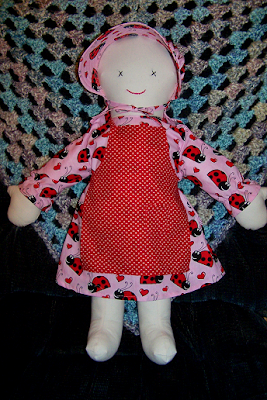 The doll is adorable (I love crafty things). Many prayers being sent up on Josephine's behalf.